. . . Old English had a number of words that began with the consonant cluster <fn>, pronounced with initial /fn/. This combination is no longer found at the beginning of any Modern English word. What has happened to these words? In the case of the verb fneosan, the initial /f/ ceased to be pronounced in the Middle English period, giving an alternative spelling nese, alongside fnese. Because it was no longer pronounced, the <f> began to be confused with the long-s of medieval handwriting and this gave rise to the modern form sneeze, which ultimately replaced fnese entirely. 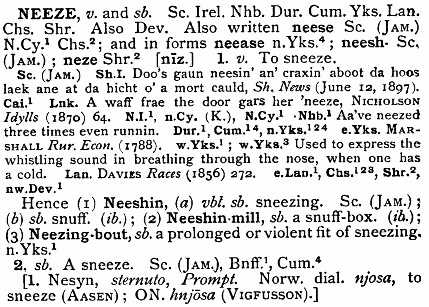 The OED suggests that sneeze may have replaced fnese because of its 'phonetic appropriateness', that is to say, because it was felt to resemble the sound of sneezing more closely. This is a tempting theory, but one that is hard to substantiate. ・ the structure of the hypothesized phonological system, for we assume that such a system will be like modern sound systems in, for example, tending toward symmetry, pairing voiced and voiceless consonants or back and front vowels.